As a company, we have made a clear commitment to CSR and see all associated initiatives as being an essential element for all our brands. Our commitment to creating initiatives to be proud of in this area, will in turn, help us towards reaching our goal of becoming a leading Asian hospitality provider. Our CSR Report demonstrates the commitment towards the continuous improvement of our CSR practices, both internally and externally. By communicating what we do, we hope to not only demonstrate transparency and accountability but also encourage improved practices under our sphere of influence. In 2012, we published our first CSR Report. Following two 18 month cycles for our first and second reports, the report will be published annually going forward. 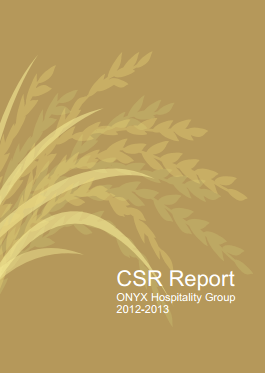 In an effort to reduce consumption of resources from printing and distributing hard copies, the report was prepared for electronic distribution and is made available for public viewing on ONYX's website. Limited copies are printed and distributed, primarily to shareholders, together with our annual report.